Oh, that looks amazingly wonderful! Ooh, yum. I haven't made chicken piccata in forever! Thanks for the great idea--I think this is going on my menu for next week. I love chicken piccata too, I am looking forward to trying Ina's. She really knows how to please the men! All hubbys love being fed Ina's dinners. 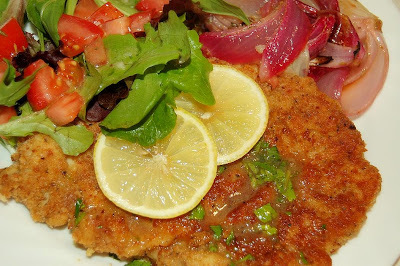 This looks fantastic -- we are big piccata fans around here. I usually have most of those ingredients on hand, too! Can't wait to make this! Another great recipe from Ina! You plated it up quite nicely! Oh, yes, this sounds fantastic! I love the way you plated it too! What a great dinner! Well, Anne, if you said you liked it better than the Chicken Parmesan, it must be pretty darn good! We really liked the CP from the summer. Looks like a delightful dinner! Yummie this looks soo good!